I was very sad this morning to see the news that Brennan Manning died yesterday. It is sadness mixed with happiness - for a person who is finally at rest with his Abba, strong and healthy once again, surrounded by the love of God in a new and amazing way, does not merit sadness. 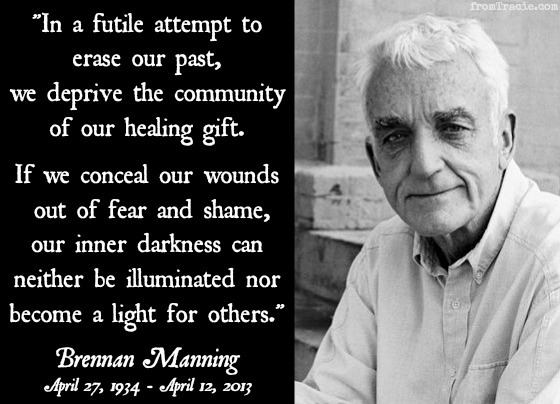 My sadness is for myself, and for the world, that there will be no new words from Manning in this life. I was blessed that Brennan Manning spoke and wrote openly about his past and his wounds. From the first time I read The Ragamuffin Gospel: Good News for the Bedraggled, Beat-Up, and Burnt Out in my teens, he challenged my thoughts about grace and unconditional love in a powerful way. Brennan Manning was a controversial man. He was a Catholic priest. He was an alcoholic. He got married. He was a ragamuffin. He was honest about himself with a level of honesty that most Christians never allow themselves. "When I get honest, I admit I am a bundle of paradoxes. I believe and I doubt, I hope and get discouraged, I love and I hate, I feel bad about feeling good, I feel guilty about not feeling guilty. I am trusting and suspicious. I am honest and I still play games. Aristotle said I am a rational animal; I say I am an angel with an incredible capacity for beer. His honesty and his theology have been criticized and questioned, but the heart of what he taught was this: God's word means exactly what it says; unconditional love truly is unconditional, and that is the love God has for us. For a confused teenager sitting alone in her room - a teenager who was hurt by the world and the church; who was working hard to deny a childhood of abuse, yet understand why her heart hurt so bad; who was raised in a cult school that embraced extreme legalism; who felt so very unloved and unworthy - that message was a light. It is hard to know what to say about an author who I never actually met, but whose words touched my life so deeply. I am grateful that Brennan Manning and Rich Mullins (the two are always linked in my heart) came into my life at exactly the right time, and blessed that God used their words to speak to my heart. Believe it or not ... I wasn't sure who Brennan Manning was when I heard he was gone. And I've never read the Ragamuffin Gospel but it is now in my Audible wish list ... along with All Is Grace. So glad that his words spoke hope and healing into your heart when you needed that! Love you!